On The Futility Of War, Part Two, Or, Twelve Times The Charm? We are halfway through a story that is about to turn winter in one of the most beautiful places in the world profoundly ugly. Just like in a Cecil B. DeMille movie, we have a cast of millions, we have epic scenery, and we have made acquaintance with someone who will go on to perform a heroic act. Unlike your typical Hollywood production, however, this movie is not going to have a happy ending-in fact, you could make the argument that it’s not over yet. So wrap yourself up in something comfortable, grab something to drink…and when you’re ready, we’re packing up and heading to the Alps. There has been, for as long as anyone can remember, some degree of “friendliness balanced with hostility” in the relationship between the Austrians, Italians, and Ladins who have been living in the Tyrol, a region of the Alps just to the east of Switzerland. In the 1800s, a variety of national unification movements emerged, leaving Italy, the Austro-Hungarian Empire, and Germany in possession of various parts of the Tyrol. For those unfamiliar with the geography, the Alps would represent a bit of trim extending all the way across the top of Italy’s “boot”; if the boot had a buckle, it would be where the Italian, Austro-Hungarian, and German borders come together in the center of the Alps. As WWI approached, there was some question as to whether Italy would join the Central Powers (Germany, Austro-Hungary, Bulgaria, and the Ottoman Empire) or the Triple Entente (Russia, France, Britain, and eventually, the United States). Italy broke its neutrality by signing the Treaty of London and attacking Austrian and other Central Powers forces along a 450-long offensive line stretching from Lake Garda to not quite Trieste. In May of 1915 the Italians had 875,000 troops trying to mount an attack uphill, the goal being to emerge near Zagreb, Croatia (and cover their backsides at the same time, thus the attack on the Lake Garda region), so they could wheel north and attack into Austrian territory while simultaneously moving south along the Adriatic coast; the Austrians were defending from the peaks with roughly 300,000 troops. Among those troops were units specially trained in mountain combat; those units recruiting from the mountain guides and hunters who lived in the mountain regions. The Austrians had in their command a legendary mountain guide-turned-hotelier named Sepp Innerkofler, who had more than 50 “first ascents” on some of the world’s toughest peaks under his belt. For those with a memory of history, Hannibal did the same thing on a much narrower offensive front, 2200 years ago, starting from roughly Nice, France and ending up between Turin and Milan, in what is today Northern Italy–a feat he performed at great cost to his own forces. And now, you’re caught up. The first four of the twelve Battles of the Isonzo were fought, along that long front, between May and December of 1915. The main tactic, on both sides, was to use artillery as a way of “softening up” the opposition, after which somebody would have to run up a hill, under fire, in an attempt to dislodge someone else from their well dug-in position (which explains why controlling the high ground is so vitally important). As the Italians attacked the Austrians were basically engaged in a slow retreat into the highest mountain redoubts, destroying the rail and road infrastructure as they went. By the time the fourth battle was over the Austrian commanders’ extremely effective defense not only had the Italians stopped cold-literally-but even worse, the few miles gained in those seven months had already cost the Italians 250,000 dead or wounded soldiers. The Austrians were losing soldiers as well-including Sepp Innerkofler. July 4th, however, was a bit of a different story. Innerkofler and five members of his “flying squad”, all top climbers, were ordered to dislodge a group of Italian mountainsoldiers (Alpini) from a mountain peak. To make this happen Innerkofler’s team was required to perform a vertical ascent upon the Monte Paterno-an ascent that was actually among his resume of Alpine “first climbs”; a feat he had achieved 19 years earlier and many, many, times since. The climb was completed by sunrise, and with the sun at their backs the Austrians began to attack with grenades and small arms and the thud of their own artillery sending shells just overhead into the Italian position. Austrian and Italian machine gun emplacements were trading fire across the ridges at each other. There are several versions of what happens next, including an almost Wagnerian account-but the eventual outcome of each is the same: Innerkofler is killed by a rock-wielding Alpini. 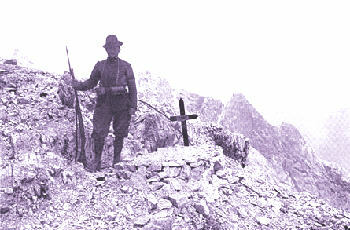 The Italians, risking Austrian fire, recovered the Austrian’s body and give him a funeral with full respect, burying him on the Paternkofel. With four of the Battles of the Isonzo down, there were still eight to go. The next May, after an exceptionally bitter winter and spring and with more equipment, the Italians were preparing to attack, again, from north of Milan to up above Lake Garda-but the Austrians had two Armies in the mountains, who were able to drive the Italians back into their own northern plain, stopping the Fifth Battle before it ever got started. It’s reported that the Austrians had to fall back from that newly acquired land partly because of problems running a logistics operation through the mountains…and also partly because the Russians mounted an offensive to the Austrians’ east. The cost to the Italians was substantial, however, as they were forced to commit 500,000 troops to the defense of the Lake Garda region. “…so the entire western margin of Col di Lana was carefully and patiently mined, an undertaking which probably took months of hard work, and several tons of high explosives were distributed in such a way as to destroy the whole side of the mountain above which the enemy was in- trenched. Just a few months later, on just one day (December 13th, a day which became known as “White Friday”) 10,000 soldiers are said to have died in avalanches; the problem being so serious that both sides had detachments of soldiers assigned specifically to the avalanche rescue mission. This went on for months and months and months, with neither side really accomplishing anything in terms of territory gained. The Italians, however, were growing their Army, both in size and in the amount of materiel they could put in the field, until October of 1917, when either the Twelfth Battle of the Isonzo or the Battle of Caporetto took place (pick your favorite name; various sources use both). The Austrians, coming down from the buckle of our boot, mounted an attack that was so successful that the Italian 2nd Army collapsed in disorganized confusion to the south, suffering severe levels of casualties; the better organized 3rd and 4th Armies seem to have lost about 20% of their forces “coming to the rescue”. While the Italian Army under General Cadorna had begun the battle with 1,250,000 troops, in two weeks he lost roughly 320,000 of them to death or capture, along with most of his Army’s artillery-and his own job. An additional 350,000 soldiers were reportedly wandering the countryside, for the moment unattached to any military organization. 400,000 people became refugees in those two weeks. Eventually the Austrians had to retreat back into their own territory; some of the reason for that being related to the same problems the Italians were having maintaining supply lines through mountains, some of the reason for that being that the Austrians were losing on other fronts. This was not the end of the fighting along the Italian-Austrian frontier, nor the end of the ethnic conflict that has peppered the region’s history, but you get the idea: no one ever really won any victories that mattered, but thousands upon thousands of people died in the effort, and hundreds of thousands more were wounded-again, all for nothing, really. Now at some point in this story we have to answer the question of…what is the point of all this? Folks, I hate to be the bearer of bad news, but the moral of this story is that there is no point. More or less 400,000 soldiers died on both sides, countless more were wounded, and hundreds of thousands of people, if not millions, became refugees. strian and Italian, were killed up in those mountains. And all of it for nothing. Italy was not able to advance its national interests at all (in fact, things got much worse), and despite everything that happened back and forth over those years, Austria certainly saw no gains: in fact, thanks to this war, the Hapsburg Dynasty also went the way of “Cats” and the Ottoman Empire…closing, after a long run. If it was my job to apply all of this to some war that my bosses were fighting…I think I’d be looking at Afghanistan, and I think I’d be looking at the place as a collection of tribal communities, rather than one big country; and I think I’d be telling my bosses that all those talking heads-and just plain folks-who think we should “defeat the Taliban” through some military campaign so that we can come home, having achieved some kind of ultimate victory, need to understand that you will never defeat anything up in the mountains simply be throwing a bunch of people and equipment at the problems. Instead, you’re going to have to consider whether it’s possible to help the Afghans create something like what is happening in the Tyrol today, where protections for the various tribal and ethnic groups could be laid out in a framework that reassures Pashtuns, Persians, and Turcoman alike that they have a place in a community of interdependent communities. This has been a long and, at times, rather depressing, look at who we are as people, and I wanted to end on a postscript that is a bit happier…and it all comes back to Sepp Innerkofler.